Have you ever wondered what Delta is good for? I mean do you even need it? 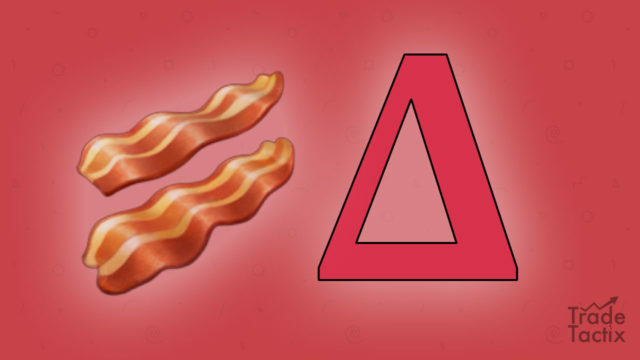 Well, it can really help save your bacon. Delta can help you manage a portfolio of positions, give you the probability of a trade being successful and help you find the right hedge. It's a powerhouse of info packed into one small little number. So what is option Delta anyway? In its most simple definition Delta is the rate of change in an options price for each $1 change in the underlying price. So for example, if a Call option had a Delta of .33 this would indicate that the option price would increase or decrease by approximately .33 for each $1 increase or decrease in the underlying stock. Bonus: Free Download. Learn to hedge like the pros with these "10 Tips for Better Delta Hedging". Simple, right? Yep, but that simple little number encompasses so much more than that. In fact, Delta can help you in powerful ways. Let's take a look at 3 of them. Hedging is one of those mystical arts that evades most traders. Probably because they like to try to seek a total hedge without realizing that there is no such thing as a “perfect” hedge. Just take the trade off if you want out. In practice, I like to hedge at about 30% or so. I just want to take a little bit of the heat off of a trade to give me a little breathing room. Knowing how to use Delta is vital if you're going to hedge. Say for example that you have 100 shares of AAPL and you'd like a little downside protection because earnings are approaching. There are a lot of ways to go about creating a hedge against this position but we're going to look at buying a Put option. We just want to take off a little of the edge on the trade, not try to protect it 100%. To start we have 100 shares of AAPL. Since stock is considered as “hard delta” each share carries a delta of 1. So our 100 shares of AAPL give our AAPL position a total of 100 deltas. As mentioned earlier we just want to take a little edge off of the trade and provide some downside relief in case the stock drops. So if we could shave off around 30 of those deltas without actually selling our stock that would give us a little room to breathe on the downside. In order to accomplish this we could consider purchasing a Put on AAPL with 30 days left until expiration that has a delta of -0.26. Since each option represents 100 shares of stock the Put option gives us -26 AAPL deltas. Adding that to our 100 AAPL stock deltas gives us a total of 74 AAPL deltas. So we now have a little downside protection in AAPL. For each $1 drop in AAPL's stock price we would loose on $74 instead of the original $100. And even better if the price continues to drop the delta of our option gets larger and provides more protection since options carry “soft delta” which increases or decreases based on the stock price. As simplistic as this example is you see that by having an understanding of delta we can quickly determine which option can help us hedge our position in AAPL. Delta is pretty cool that way. What if we had more than just one stock in our portfolio and were getting concerned about a market sell off? How do we hedge en entire portfolio? Once again, delta to the rescue. One of the key characteristics of Delta is that it shows your directional risk. A positive Delta indicates that you are long or that your position will increase in value as the price increases. While a negative Delta indicates just the opposite. Adding up the Delta across all of the positions in your portfolio can give you a quick indication of whether you a long or short the market as a whole. And the size of that Delta can help you to get a feel for by how much you are long or short. Your broker platform should be able to help you do this. While this isn't going to tell you precisely how much you'll gain or loose if the market moves it will give you a sense of where you are sitting. If you have +1000 Deltas then you know that you are long the market and are likely to be up or down approximately $1000 for a $1 move. Likewise if you're holding just -50 Deltas you know that you are almost flat and slightly short the market. How much Delta is too much? That's only a question that you can answer. What is the size of your portfolio? What is your risk tolerance? What is your current directional bias to the market? There are a lot of factors that come into play. But at least with Delta by your side you have a sense of things rather than just flying blind. Of course this is just a quick birds eye view. In order to get an accurate picture you'll need to beta weight your entire portfolio against some underlying such as the SPY. At this level of accuracy you could then buy SPY Calls or Puts to hedge against your entire portfolio in a manner similar to the AAPL example above. Another amazing aspect of Delta is its relationship to probability. An options Delta is a close approximation of that options likelihood of expiring In-The-Money. Simply by looking at an options Delta we can determine the probability that the option will contain intrinsic value when it expires. Take a look at this option chain on AAPL. You'll notice a column called “Prob ITM”. 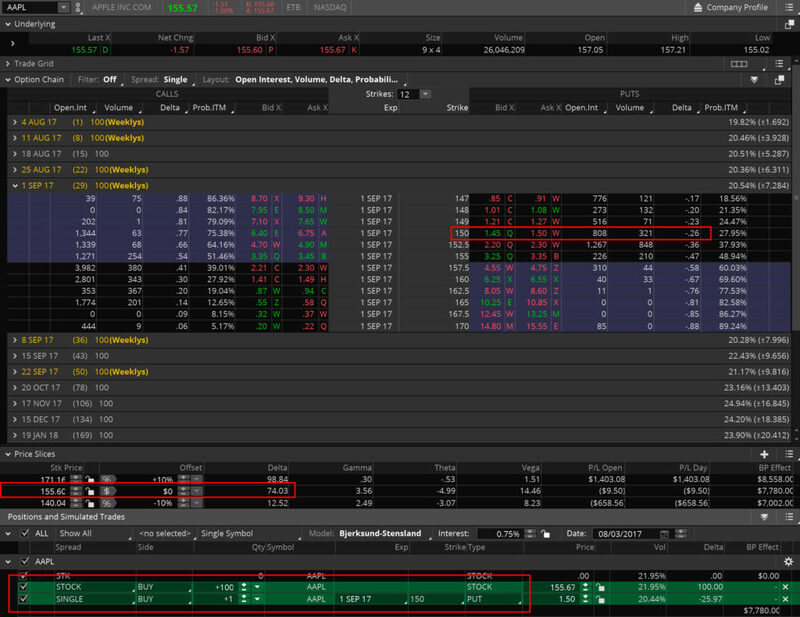 That's the probability that the option will expire In-The-Money as calculated by ThinkOrSwim. For example, take a look at the 150 Puts. The “Prob ITM” column says 32.91% that the option will contain intrinsic value at expiration. Now look just to the left at the Delta column. The 150 Put's Delta is 0.30 or 30 Deltas. Granted 30 isn't 32.91 but it's pretty darn close. Take a look at some of the other Puts and Calls. You'll notice that the two values are always within a few percentage points. This is because Delta is a good approximation for an options probability of expiring In-The-Money. So no matter what options platform you are using or how you currently have yours configured you can always determine an options probability of expiring In-The-Money simply by looking at the options Delta. Pretty cool, right? These were just a handful of the ways that Delta can help your stock and options trading. Delta is an extremely useful tool and if you aren't using it daily in your trading then you could be putting yourself at risk. You owe it to yourself to know as much as possible about the underlying characteristics of your trades and how to read and manage them.